Des « bijoux » qui dérangent, attirent -comme pourrait attirer un corps nu, partiellement dévoilé à travers un trou de serrure-, et en même temps « répugnent », comme si l’on pouvait -enfin- regarder (sans être vu) tous ces orifices « défendus » du corps humain ….. attraction-répulsion …. « Should I look, or look away? In an instant, Yuyen Chang confounds the viewer. 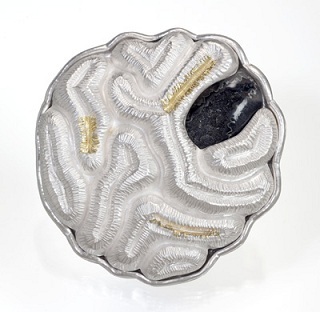 Her complicated work plays on our innate attraction to jewelry, its invitation to gaze, and our equally human repulsion from physical deformities: scars, growths, cysts, wounds. As baubles and boils incite these diametrically opposed responses, Chang’s difficult pieces send one scrambling for the socially appropriate behavior. 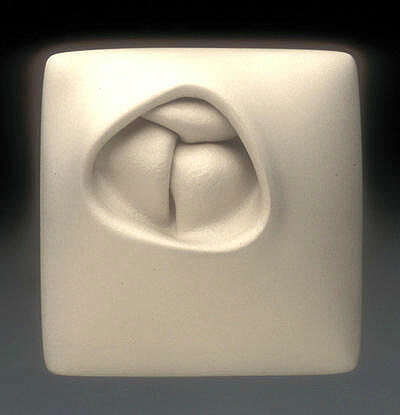 Chang’s work is intentionally anthropomorphic, disturbingly so. 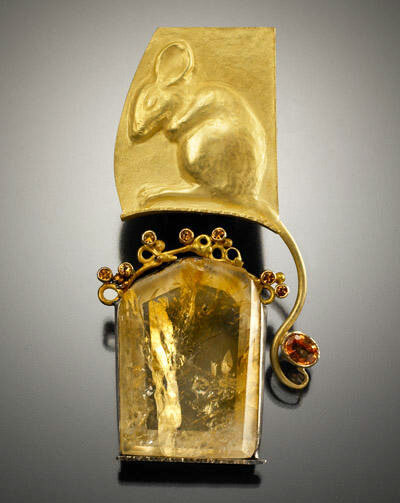 She likens her technique to that of a plastic surgeon, shaping and sculpting on and beneath the surface, using traditional fabrication methods like die­forming, chasing, and repousse. Yet Chang’s goal is hardly to beautify or’ improve’ her subjects; she labors to distort, to subvert. 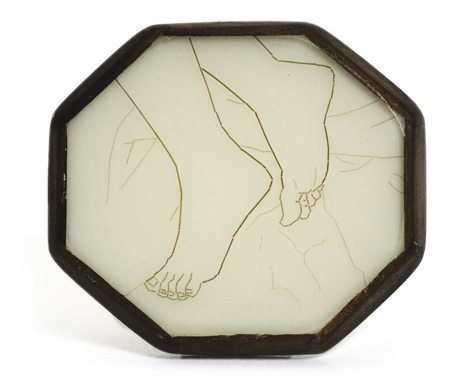 Though Chang made these pieces while still a student, she reveals an awareness of the allure-enhancing and status-bestowing powers of jewelry, especially in modern society, as well as our obsession with erasing any wrinkle, bulge, or flaw. 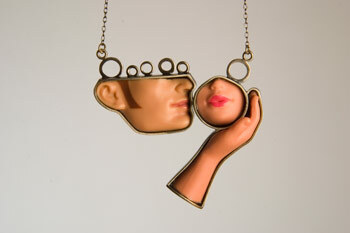 A most unusual jewelry artist, Chang bypasses witty and aims straight for unsettling. 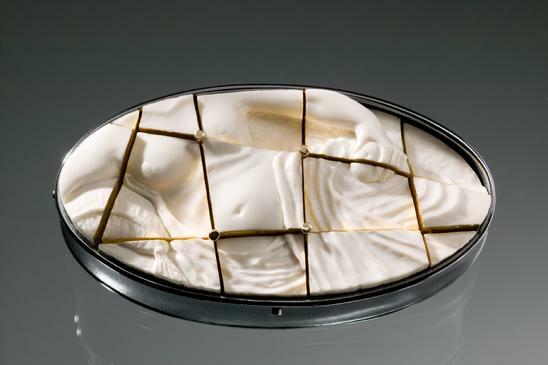 If one were simply to describe her navel- or mouth like brooches, they might seem wry or humorous, but in the flesh, as it were, her jewelry incites not a smile but a straight face-maybe even a wince. This is volatile territory, indeed; deformities are not a laughing matter. 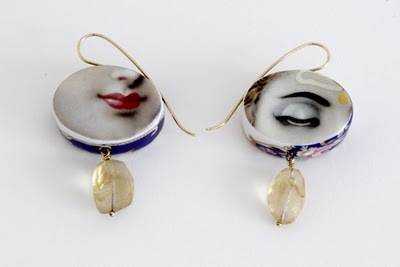 But our compulsion to look at them, Chang proves, is a fruitful topic for art indeed, especially art meant to be worn on the body. Dessus, ou dessous, ornez votre épaule/aisselle !!! 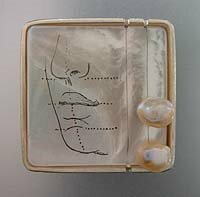 Des bijoux qui représentent le corps humain, mais fractionné, bout à bout, comme des petits cailloux pour la mémoire semés par un Petit Poucet qui voudrait retrouver le (bon/droit) chemin …. 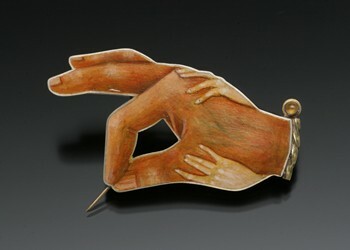 et, dès le départ, la série de Jessica Calderwood nous fait de l’oeil …..
Jessica Calderwood ‘Asymmetry’ Brooch- Enamel on copper, sterling, 18k foil. 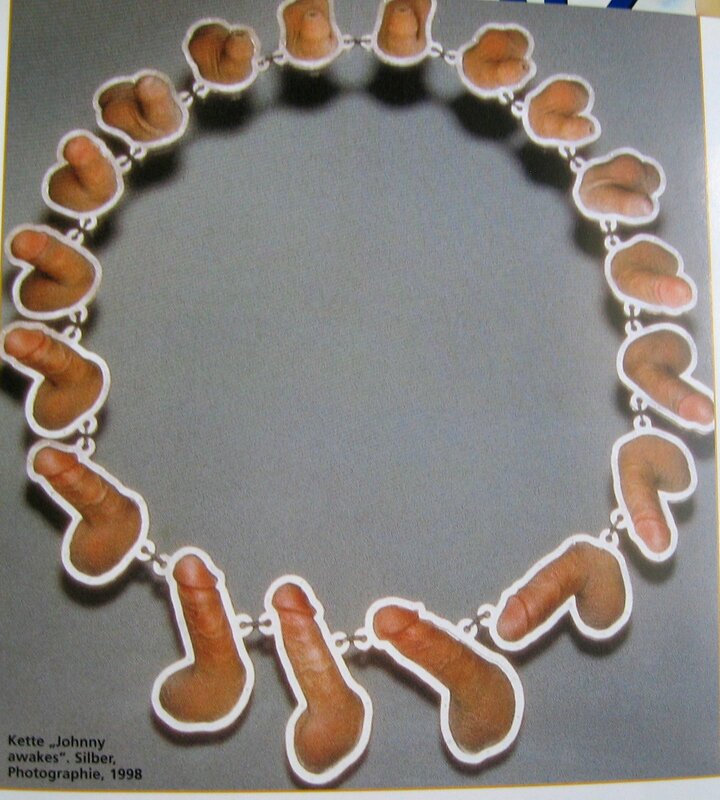 « The images used in this series of jewelry pieces are appropriated from a pulp magazine printed during the 1950’s titled Secrets. The magazine photos were overly dramatic and stagy, both tragic and unintentionally comic, but somehow they captured the zeitgeist regarding female transgression. These reconfigured images freeze a moment in the daily drama of our lives and, set as jewels, they serve as paeans to the mundane. 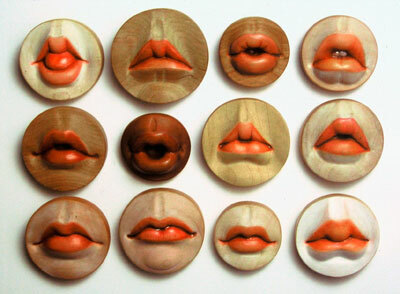 Claire Lavendhomme - « Le plus profond c’est la peau » 2007. Bagues – argent, photo, résine, sable. et… ma dernière « trouvaille » … mais ne dit-on pas qu’on garde le meilleur pour la fin ? 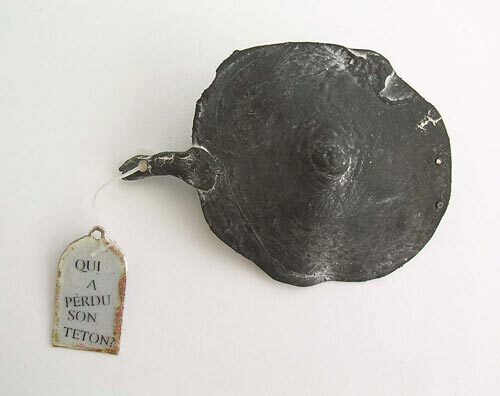 Velvet da Vinci in San Francisco presents: Chased + Repoussé, an exhibition shown in conjunction with the release of the recent publication, Chasing and Repoussé, Methods Ancient and Modern, by Nancy Megan Corwin. 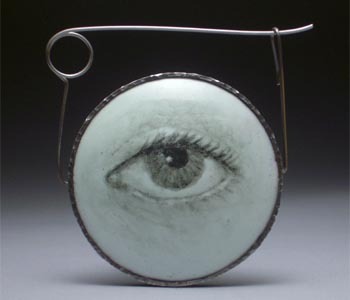 This exhibition includes work from twenty-one contemporary artists who share a passion for these ancient metalworking techniques, many of whom have work included in Corwin’s book. The twenty-one artists reflect a range from traditional roots to modern approaches to the practice of chasing and repoussé. 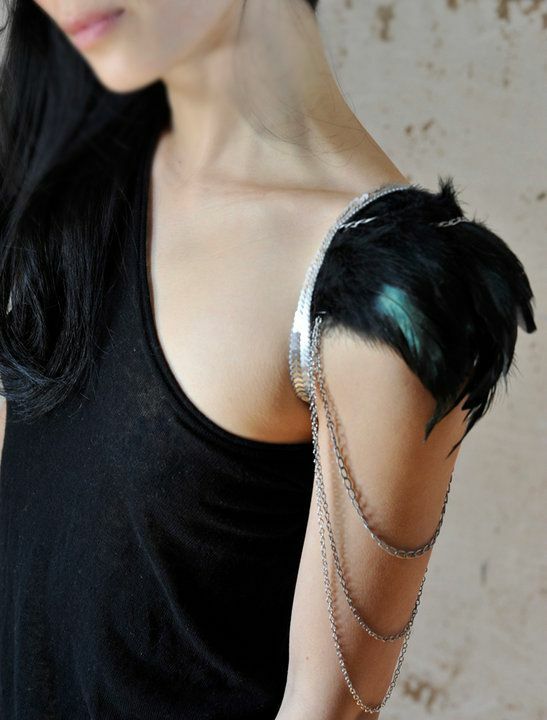 Dating back to antiquity, the technique has been used to add embellishment on armour, large scale sculpture, and gold and silver jewelry. The Statue of Liberty was formed from a sheet of copper using chasing and repoussé, as was the mummy mask of King Tutankhamen. 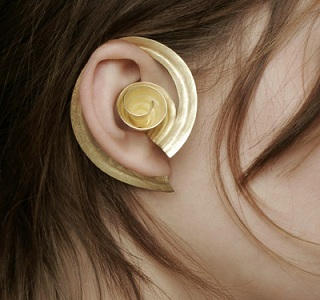 « Chasing and repoussé are methods of metalworking in which the metal is embossed from both front and back, creating a three-dimensional form from a two-dimensional sheet. Repoussé is a French word meaning « to push up or forward. » It refers to a family of techniques that form sheet metal. Repoussé can be thought of as focusing on the creation of volume, while chasing is work done to the front such as planishing, lining, matting, and making crisp edges on forms that were raised from behind. The techniques of chasing and repoussé are traditionally used to add detail to the surface of a piece of hollowware or jewelry. Sheet metal, hollow-formed metal, flatware, and sculptures can all be chased (textured and refined from the front with steel tools called chasing tools and using a chasing hammer), and worked from the back with soft-faced steel tools (repoussé). Candace Beardslee, Jessica Benzaquen, Davide Bigazzi, Kate Case, Yuyen Chang, Nancy Megan Corwin, Christina Gebhard, Catherine Gilbertson, Catherine Grisez, Komelia Hongja Okim, David Huang, Cheri Lewis, Keith Lewis, Charles Lewton Brain, Jackeline Martinez, Joe Meunch, Liza Nechamkin, Miel-Margarita Paredes, Linda Kindler Priest, Suzanne Pugh, Greg Wilbur. 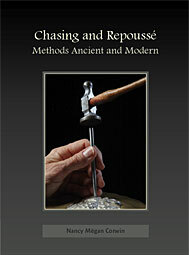 BOOK : « Chasing and Repoussé, Methods Ancient and Modern« , by Nancy Megan Corwin.